The right tires not only help contribute to your vehicle's handling and performance, but can also impact fuel efficiency and safety as well. If your tires are showing signs of wear, you can get exact replacements for the original tires at a competitive price at Keyes Toyota Service Center. Our factory trained and certified Toyota technicians will ensure that your tires are mounted, balanced and inflated to match your Toyota vehicle's specifications. Keep your Toyota a Toyota by replacing your original tires at Keyes Toyota Service Center conveniently located in Van Nuys. Tires are some of the most important parts of your vehicle. Once the tread has worn down, it’s time to get them replaced for the safety of you, your passengers and your Toyota car. Trust the expert staff at Keyes Toyota to inspect your tires and find the perfect replacements. We can find an exact match to the tires your car originally came with or a set that works best for your driving tendencies. Call our service center at 844-781-4306 or contact Keyes Toyota today to schedule an appointment. We would be more than happy to hear from you at our nearby Toyota dealership. 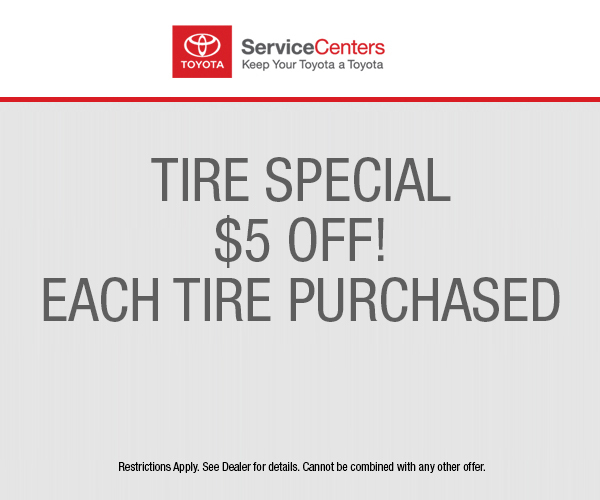 And don’t forget to check out our Toyota service specials for the chance to save on your next visit!